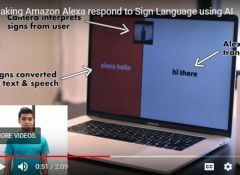 Alexa is learning sign language! Here is a great story from Fast Company about a creative developer who has built a solution to interpret American Sign Language and convert it into voice commands for the Amazon Echo products. Technology is always moving ahead and here is another way this device, which is already being used to support people with physical disabilities live more independently, now is able to help those with hearing/vocal impairments as well. Follow this link to read the article on Fast Company's website about this new app that is interpreting sign language for the Amazon Echo. The article and images are the sole property of Fast Company and are only linked here for information sharing.